The 1850s: Coin Availability Improves as Nation Drifts Toward Civil War. As coins circulated freely for the first time ever in the 1850s, the United States continued its drift toward civil war. Tensions between the North and South grew to a fever pitch. The Compromise of 1850, the Kansas-Nebraska Act, Bleeding Kansas, and the Election of 1860 dominated news during this time. The "Coins & History Chapters" button at upper right opens up other units in our US Coins & History section. The links below are installments in the "Nation Drifts Toward War" chapter. By the end of 1849, California's population had ballooned to over 100,000, more than enough to qualify for statehood. A convention met in Monterey and drafted a state constitution, which included a slavery prohibition, later to be approved by the people. In 1850, when California applied for admission to the Union as a free state, a raucous Congressional debate erupted. Southerners were furious over the prospect of California, and perhaps other states later to be formed out of the Mexican Cession, entering the Union as a free state, thus upsetting the balance of power in Washington. Some spoke openly of Southern secession. As the debate raged, the United States stood at the precipice of disunion and civil war. 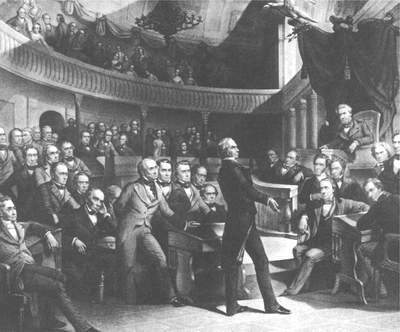 Old and feeble, Henry Clay presents his 1850 compromise to the Senate, Future President Millard Fillmore (presiding), John C. Calhoun (right of Fillmore), and Daniel Webster (head in hand) listen intently. Drawing by Peter Rothermel. Public domain image. Against this ominous backdrop, 72-year old Henry Clay stepped forward to offer a compromise to save the Union. First elected to Congress in 1810 and a three-time presidential candidate, Clay was a towering figure in American politics. Standing weak and feeble on the Senate floor, Clay proposed a series of resolutions carefully drafted to balance the interests of the North and the South. They were: (1) The immediate admission of California as a free state. (2) The organization of land acquired from Mexico (except California) into the territories of New Mexico and Utah, with each territory to decide for themselves whether or not slavery would be allowed, on the basis of "popular sovereignty". (3) A payment of $10 million to Texas for settling debts the Texans owed to American creditors since the 1830's, if the state would abandon its claim to parts of New Mexico east of the Rio Grande. (4) The abolition of buying and selling slaves --but not slavery itself-- in the District of Columbia. (5) Slavery was not to be abolished in the District of Columbia without approval of its residents and the state of Maryland, and then only if owners were fairly compensated for their slaves. (6) A stricter fugitive slave law, one that require local law enforcement to cooperate with federal officials in the capture and return of escaped slaves. 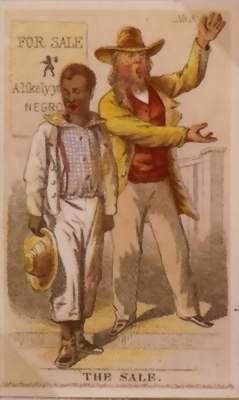 An advertisement for a slave auction. Image courtesy of Library of Congress. Clay's proposals were followed by one of the most critical Senate debates in American history. Day after day, the Senate gallery was filled with important spectators and newspaper reporters. Magnificent speeches went on for hours and sometimes longer. John C. Calhoun of South Carolina, also elected to Congress for the first time in 1810, wrote a stinging condemnation of Clay's compromise. Too sick to deliver the address himself, another southern senator read the impassioned speech for him. Calhoun warned that while it was important to preserve the Union, he was willing to rip it apart if the interests of the South were at stake. Massachusetts senator Daniel Webster, perhaps the greatest orator of his time, and like Clay and Calhoun, a longtime veteran of Washington, pleaded eloquently of saving the Union by voting in favor of the compromise. Most Americans in both the North and South seemed to favor the compromise. In September 1850 Congress adopted all of Clay's proposals by comfortable margins. The nation rejoiced. Newspapers praised the work of Clay and his colleagues for preserving national unity. The Compromise of 1850, as it came to be called, at least for a time lessened sectional strife over the issue of slavery. But would the compromise last? This was on the minds of many as the 1850's continued on. 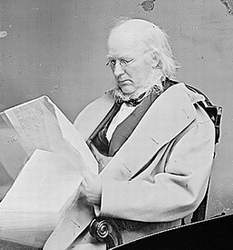 Horace Greeley, a fixture on the national stage for many years, was most famous for his advice "Go West, Young Man". As a founding member of the Republican party, his exuberant spirit highlighted American politics in the 1850's. Image courtesy of the National Archives. While the North-South crisis continued to simmer, both sides could at least agree that something needed to be done to retain more coins in circulation. The problem stemmed from the fact that US silver coins contained a high percentage of the precious metal, and were worth more in silver content than face value when the metals market increased even slightly. These conditions led to hoarding and a reduction in the quantity of coins available for public use. Numerous European countries avoided similar shortages by "debasing" their coinage, that is, keeping the intrinsic metallic worth of their coins low enough so as to have very little melt value. In the United States, the concept of debased silver coinage had also been successfully modeled, albeit on a limited basis, with the introduction of the 1851 three cent "trime". With these examples in mind, Treasury Secretary Thomas Corwin requested legislative action to similarly remedy the coin shortage problem, and to establish a gold standard. "We give way to this debasement [of silver] as inevitable... Let it now be solemnly enacted that gold is the national standard of value... Let the silver coinage be altered to conform to the fact, but let the standard of gold be unvarying evermore -- silver being used as change..."
On February 21, 1853, two weeks after Greeley's editorial appeared, Congress passed a law reducing the silver content of all silver coins, with the exception of the already debased trime, and the silver dollar, by about 7%, to make their metal value less than face value. Now that American coinage was less attractive to metals speculators, coin production at the US Mints kicked into high gear, and for the first time in history, an adequate flow of coins were circulating in the channels of commerce. 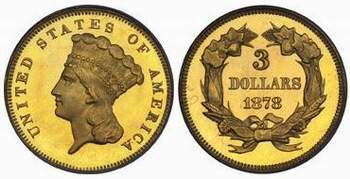 Three dollar gold coins were authorized in 1853, and were produced from 1854 through 1889. The 1878 specimen shown above, graded in Proof-64 condition, is valued at nearly $35,000. Photo courtesy of Ira & Larry Goldberg Coins & Collectibles, Inc., Beverly Hills, CA. In addition, the new law limited the legal tender status of silver coins to transactions less than five dollars. In effect the nation was put on a gold standard, by fixing its value while letting silver float, and by making gold coins acceptable as payment for any debt size, without regard to the five dollar limit. The gold mining lobby also managed to tack on an amendment to the 1853 law authorizing a new three dollar gold piece. Ostensibly to be used as handy coin to purchase a sheet of 100 three-cent postage stamps, the three dollar gold coin was difficult to design because it had to be made thinner than normal so as to have an easily distinguished larger diameter than the quarter eagle ($2.50), another coin containing a nearly identical quantity of gold. 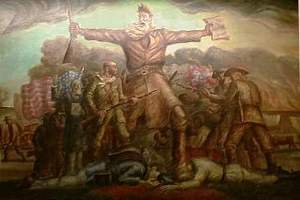 Abolitionist John Brown, shown here in John Steuert Curry's State Capital building mural in Topeka, KS, believed God was calling him to murderous vigilante action against pro-slavery forces coming to Kansas. The warfare in Kansas was a tragic prelude to events to come nationally. Brown was hanged in 1859 for his failed attempt to capture the arsenal at Harper's Ferry, Virginia, in the hope of igniting a slave rebellion. Image courtesy of Kansas State Historical Society..
Old wounds were reopened with the passage of the Kansas-Nebraska Act in 1854. Sponsored by Senator Stephen A. Douglas, the act organized Kansas and Nebraska into territories, authorizing settlement of the areas. It also repealed the Missouri Compromise and gave both territories popular sovereignty, allowing settlers to decide for themselves whether or not they would permit slavery in their territory. Pro-slavery and anti-slavery factions sent forces to Kansas, and soon violence erupted. “Bleeding Kansas” became a localized civil war battleground, claiming more than two hundred lives. For both the North and the South, Kansas was seen as a great prize in the debate over slavery. Two illegal territorial governments were formed in 1855, one in support of slavery, the other bitterly opposed. In the end, Kansas was admitted to the Union as a free state, on January 29, 1861. 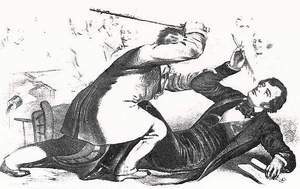 The Senate floor caning by Preston Brooks left Charles Sumner seriously injured. During his three year recovery, Sumner's empty Senate seat was a constant reminder of the bad feelings between the North and the South. Public domain image. A vicious, dramatic attack, foreshadowing national future events, occurred on the Senate floor on May 22, 1856. Senator Charles Sumner of Massachusetts, an avid anti-slavery legislator, had recently delivered a speech about “the crime against Kansas”. During the speech, Sumner demanded the admission of Kansas as a free state, and sharply criticized Senator Andrew Butler of South Carolina. Preston Brooks, a member of the House of Representatives from South Carolina, and a relative of Senator Butler, approached Sumner as he sat writing at his Senate desk. Seeking revenge for the insults heaped upon Butler, Brooks severely beat Sumner with a cane. Although Sumner eventually recovered from his injuries, tensions between the North and the South became even more strained. As the number of United States coins in circulation increased, the necessity for the use of foreign and private coins decreased. Congress enacted a law in 1857 to prohibit the continued use of foreign and private coins in circulation. The 1857 law also called for the elimination of the half cent coin, and replaced the large copper cent by a smaller cent design having a metallic composition of 88% copper and 12% nickel. The large coppers were unpopular (“too ugly, too heavy”) with the public and were costly to produce at the mint. The 1856 Flying Eagle cent is worth $6000 to $175,000, depending upon condition. Coin Photo courtesy of Ira & Larry Goldberg Coins & Collectibles, Inc., Beverly Hills, CA. The new small cent authorized by the 1857 law was called the Flying Eagle cent. Actually, about 1000 or so trial specimens of the coin were minted in 1856 to verify the suitability of the copper-nickel alloy. 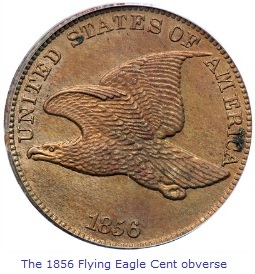 Thus, the 1856 Flying Eagle ushered in a new, smaller cent with a diameter standard carried forward to the present day. Since the 1856 trial specimens were produced in advance of congressional action, they lacked legal standing, and technically, were never permissible tender. Even so, a few of them still reached circulation. Under a program sponsored by the Mint in 1857, the old large coppers were exchanged on a massive scale for the new cent, to hasten the transformation. Demonetized foreign silver coins were also involved in the exchange program. 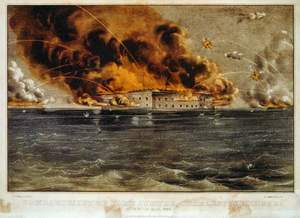 Bombardment of Fort Sumter, as depicted by this Currier and Ives lithograph. Federal troops held out 34 hours, before surrendering. Incredibly, no one was killed in the heavy shelling. The fort's defenders were allowed to return to the North. Image courtesy of Library of Congress. As the 1850’s came to a close, the stage was set for a fracture between the North and the South. The election of Abraham Lincoln in November 1860 was the earthquake that finally split the nation asunder, along predictable economic, geographic, and political fault lines. Within six weeks, South Carolina, fearing their way of life was in great danger, seceded from the Union. Other southern states quickly followed South Carolina’s example. In February 1861, representatives of the secessionist states met in Montgomery, Alabama to form the Confederate States of America. Jefferson Davis of Mississippi was elected President of the CSA. In the early morning darkness of April 12, 1861, the Confederates fired upon the Union position at Fort Sumter at Charleston, South Carolina, forcing federal troops stationed there to withdraw. The American Civil War, or as others prefer to call it, the War Between the States, was on. 3 Schwarz, Ted. A History of United States Coinage. 4 Taxay, Don. The U.S. Mint and Coinage. New York, NY: Arco Publishing Company, 1966. 5 Doty, Richard. America's Money, America's Story.